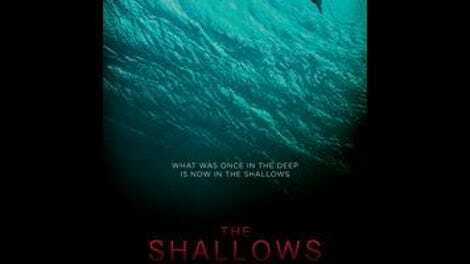 Dappled by glints of Capri Sun light, the blue waves of a secluded Mexican beach beckon the young and hardbodied to surf and fall prey to a humongous CGI shark in The Shallows, a fitfully entertaining mix of offscreen gore and Maxim-esque T&A. Med student Nancy (Blake Lively) goes out surfing alone, only to have the shark take a bite out of her thigh. Trapped on an outcrop of rock a few hundred yards from shore, she is helpless to watch as surfers and would-be beach thieves also get chomped, the wound on her leg growing more and more fetid. Hamstrung by a PG-13 rating, the movie’s juxtaposition of lithe and gangrenous bodies and nature at its most picture-perfect and disgusting (see: the rotting humpback whale carcass that first hints at danger) squirms too much to come across as a true nightmare scenario. Instead The Shallows finds its too-brief moments of suspense in Nancy’s attempts to MacGyver her way back to shore, using her earrings as medical staples or a swarm of stinging jellyfish as cover against her great white nemesis. Director Jaume Collet-Serra is a reliable hand at gimmicky genre pieces, but he makes only sporadic use of the heroine’s limited point of view. Viewers hoping for a repeat of the director’s superbly entertaining Liam Neeson thriller Non-Stop, a locked-room mystery set aboard a trans-Atlantic flight, may be sorely disappointed. However, The Shallows gives Collet-Serra even more opportunities to visualize text messages and screens, using large translucent pop-ups in lieu of close-up shots—making conflicts between technology and nature, and idyll and reality, an essential part of the movie’s mise-en-scène. Introduced as she’s getting a lift from friendly local/exposition sounding board Carlos (Óscar Jaenada), Nancy has come out to Mexico to find the spot where her late mother surfed 25 years earlier, near an island that resembles a pregnant woman lying in profile. It’s one of several dreamlike images that pop up in The Shallows. From its lens-flare-speckled cheesecake shots of toned bodies to the fairy-tale-like moon that hovers over the water at night, the movie is better at synthesizing fantasies of the beach than at shattering them; its shark, one of those elastic-looking digital monsters that seems to change size from shot to shot, is good for a few early jump scares. Nancy keeps pinning her hopes on gadgets—be it a waterproof watch, a phone she left on the beach, or a flare gun locked in a nearby buoy—and on strangers who either can’t hear her or can’t understand her very limited Spanish. The way back to the beach, close enough to be within shouting distance, is through the irrational. But Anthony Jaswinski’s screenplay bogs down this no-brainer survival premise (“get off the rock and don’t die”) with needless backstory and inchoate themes. Can’t a heroine just survive a vicious shark attack without also having to overcome a family trauma and make a decision about whether or not she wants to be a doctor?